Planning a family vacation can be challenging when you have to balance maximising your vacation leave and budget so thankfully for us, being in Singapore means we have access to nearby destinations which are just a short distance away and also cheap flights with a wide selection of low cost carriers. To maximise our limited vacation leave next year, we have already planned ahead for our family trips during the 4 long weekends in 2019. We have put together some tips and suggestions for 4 child-friendly destinations in Asia that you should check out. Spring time is the best time to check out Hong Kong Disneyland with our child as the temperature is just perfect – cooling and comfortable (we need not put on thick layers of winter wear and we will not sweat too much from a whole day out at the theme park). There are many rides to suit children of all ages as well as the young at heart (us!). If you are tired out from all the walking around in the theme park, you can catch the Golden Mickey shows performed by Mickey and friends who speak in Cantonese but don’t worry, you won’t miss the plot as there are Mandarin and English translations projected onto a screen by the stage. Wrap up your day at Hong Kong Disneyland with the fireworks show over Sleeping Beauty Castle. 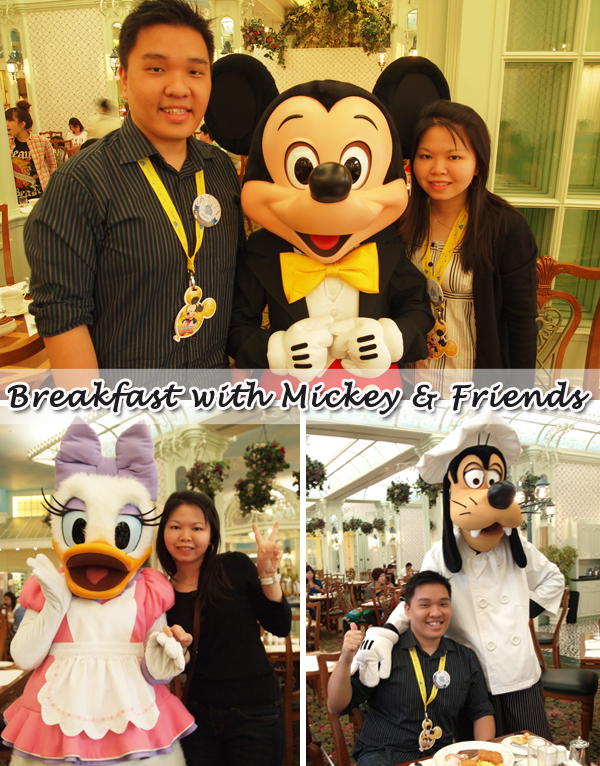 Don’t miss the breakfast with your favourite Disney characters at the Enchanted Garden restaurant! If your kid is like mine who loves to swim and play with water, you can plan for a beach holiday over this long weekend. I recommend Cebu for its beautiful beaches and clear blue water. 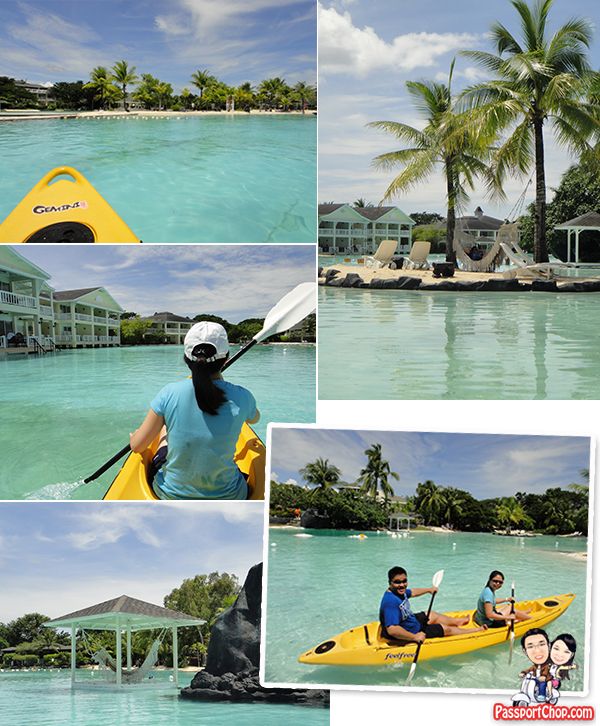 We had stayed at the Plantation Bay resort in Cebu which is famous for its huge man-made freshwater lagoon in the middle of the resort. You can kayak and swim right inside the resort and if you are staying at a pool-side room, you can jump right into the pool! There is also a Children’s Lagoon with a maximum depth of 0.5 metre so children can also have safe water fun. Besides water activities, your child will also have fun at the Pitch and Putt golf course and riding around the resort in a horse carriage. If you are staying at Plantation Bay for a 5 Day 4 Night trip, we have compiled a suggested Plantation Bay itinerary that you can plan your activities around. This is a longer weekend compared to the other 3 long weekends – you get 4 days off. I would recommend taking 1-2 more days of vacation leave to make it a week- long holiday and fly to Perth, Australia. Rent a car for the flexibility to check out various fun attractions around Perth. 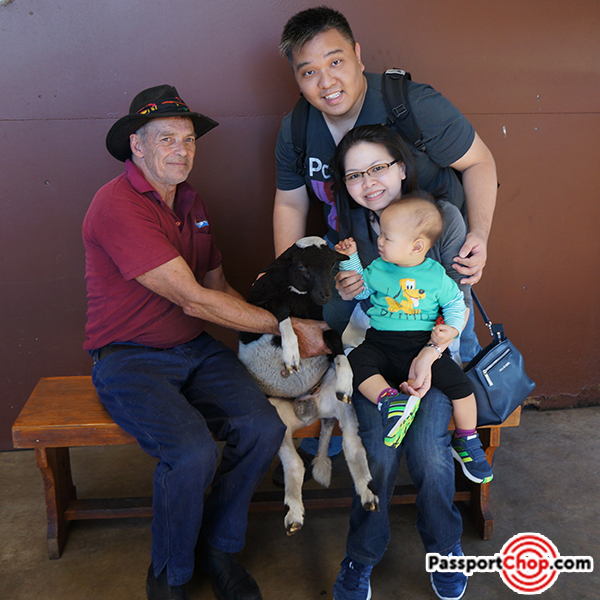 Don’t miss Swan Valley – just a 30- minute drive from Perth – where you can get up close with animals at the Caversham Wildlife Park. Catch a farm show where you can see the farmers shear sheep and if your kids are brave enough, they can volunteer to bottle-feed baby goats. There are also opportunities to get up close to various native animals e.g. koalas, wombat and kangaroos. 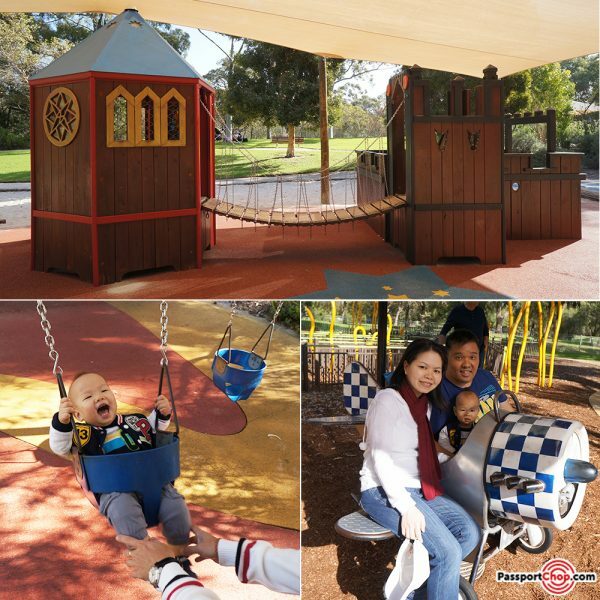 If your little one needs the space to run around and expend his energy after a long drive strapped up in his car seat, there are lots of family-friendly playgrounds around Perth. Check out King’s Park Lotterywest Family area (suitable for toddlers 1 to 2 years old) and Synergy Parklands (for older kids 3 years and above). If you need ideas on what to do in Perth, check out our suggested 6 Day 5 Night Perth itinerary here. There are many attractions in Bangkok that your child will love e.g. Dinosaur Planet (a prehistoric-themed amusement park with life-sized dinosaur replica), Funarium (a huge indoor playground with large climbing structures and water play area). 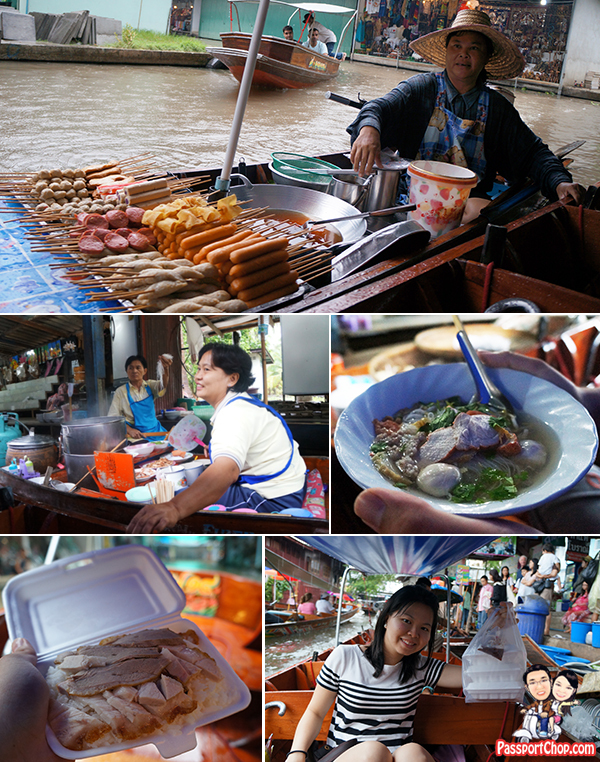 I would also set aside a day for a trip out of Bangkok to check out the interesting Maeklong Train Market and Damnoen Saduak Floating Market. These experiences will definitely make for great memories and I can only imagine my boy telling his friends at kindergarten about how he got up close with a train that moved slowly over a market and how he enjoyed delicious food while moving around in the boat at the floating market! While some of the above destinations are fun and child-friendly, unfortunately some of the cities have quite bad traffic conditions and pollution. The pollution can be quite bad sometimes and medical conditions like asthma may be triggered. Personally, I had a very bad experience with asthma a few years back when I was visiting a city (which I shall not name here). I had childhood asthma which is very rarely triggered during my adult life but the pollution was so bad that suddenly I found it very hard to breathe and realised that I am having an asthma attack (I don’t have an inhaler with me as I had not had an asthma condition for years). I took a taxi to a hospital where I was hospitalised and treated for my condition. Being a foreigner, I paid the full unsubsidised bill for my treatment and medicine which added up to a few hundred dollars. I had expected to claim for these expenses with my travel insurer but my claims were rejected as medical conditions like asthma are considered pre-existing conditions, which are excluded from most travel insurance plans! To be fair to the insurer, the non-coverage of pre-existing conditions is indeed mentioned in the fine print. When I read the fine print, I was very surprised that quite a number of common medical conditions are considered pre-existing, for example, asthma, heart disease, hypertension. I have been sourcing for travel insurance plans that cover pre-existing medical conditions and I am glad to learn that MSIG Insurance has a new travel insurance product called TravelEasy Pre-Ex which is designed to provide peace of mind for travellers with pre-existing illnesses. MSIG offers 3 types of plans for Single Trip travel insurance – Pre-Ex Standard, Pre-Ex Elite and Pre-Ex Premier, so you can choose a plan which suits your needs. What’s great about the MSIG TravelEasy Pre-Ex plans is how easy it is to apply for it – there is no complicated medical forms to fill in or a need to see a doctor beforehand for assessment – all you have to do is answer 5 simple health questions at the point of purchase and you are ready to buy the TravelEasy Pre-Ex insurance. Perfect if you are doing last minute travel insurance purchase on the go while on the taxi to the airport! 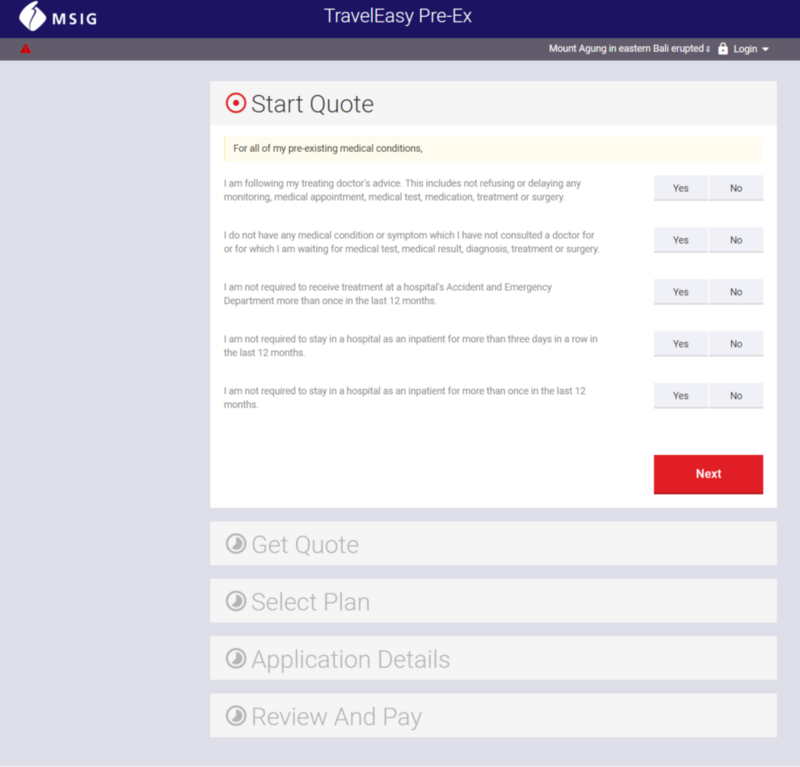 Find out more about the MSIG TravelEasy Pre-Ex plan here.